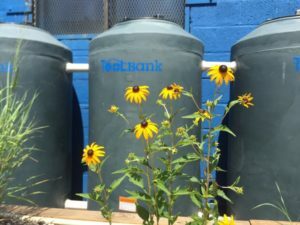 In addition to consciously minimizing our environmental footprint through energy efficiency and mindfulness, the Baltimore Community ToolBank features significant on-site projects that allow us to repurpose rain water that falls from our roof. 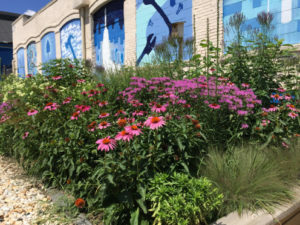 Two main on-site features allow us to repurpose more than 600,000 gallons of stormwater runoff annually from over two acres of rooftop: 1) ToolBank Rain Gardens and 2) Stormwater Factory. 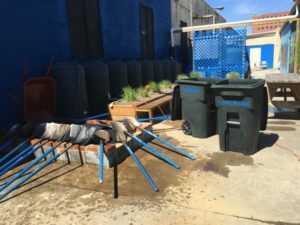 Rainfall is rerouted to water native plants and wash tools. 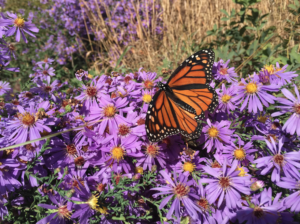 In turn, native flora creates bio-habitat for a range of pollinators from birds to butterflies to bats to bees and more. Additionally, the ToolBank engages hundreds of volunteers annually to build floating wetlands. These small, manmade units mimic the benefit of natural wetlands by creating a bed for native plants. A host of marine and avian wildlife utilize floating wetlands for food and habitat while root systems of native plants filter pollutants out of water, including nitrous and phosphates from agricultural runoff that pollutes the Chesapeake Bay. 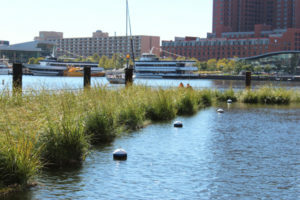 The ToolBank produces an average of 10 floating wetlands annually that live in Baltimore’s Inner Harbor. 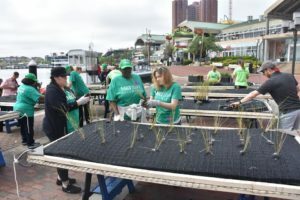 This initiative is a partnership between the ToolBank, BioHabitats, Inc. and the Waterfront Partnership of Baltimore.